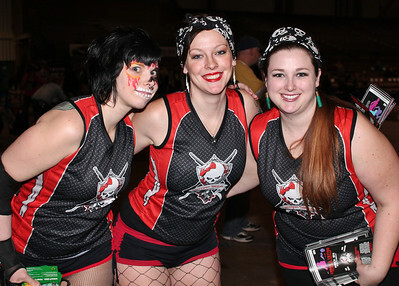 This weekend’s Dead Girl Derby presentation of Game 2: Shamrocks, Shillelaghs, and Shenanigans nearly topped last month’s home opener, and KC Derby Digest was, once again, on hand to witness the madness. The Deadly Sirens squeaked out a win against the Lovely Lethals 43-41 in a nailbiter that left the Ladies in Pink with an 0-2 start for the first time in their history; don’t expect them to stay there. Next, the Shotgun Sheilas pulled out a modest 21-point win over a Royal Pains team that has never, ever looked better; expect great things from both of these squads this season. Finally, the ultra-tense Throwback game saw the Black Plague snag a last-second win over Gang Green 82-80 that left everyone at Hale Arena breathless. Click to see the full album of awesomeness. It was an absolutely phenomenal night of flat track derby action, and anyone who wasn’t there seriously missed out. Tickets for Game 3: Hair Bands from Hale are already on sale from your favorite Dead Girl, or keep an eye on Ticketmaster, where they’ll be available shortly. We hope to see everyone there. The way this season is going, no derby fan in his/her right mind would miss out if they could help it.